I get emails everyday from readers asking me what are the best supplements for fat loss and muscle building, what workout programs are the most effective, and what diet book should they be reading to help them achieve their goals. My answer is always the same - buy Burn The Fat, Feed The Muscle. 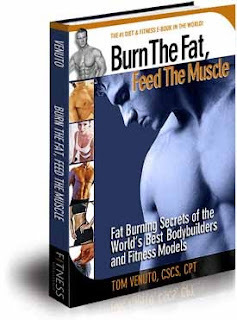 It is the one book I read over 5 years ago that taught me everything about nutrition, fat loss and muscle building, long before I even thought about writing a blog. I have recommended it to my friends, family, and people I know who are personal trainers just starting out in the industry. Now, you guys know I don't plug products on here. Companies and people contact me daily, but I have only featured two Hot Products so far, both of which I personally use and don't receive anything for promoting, and two fitness books that I have read and use. Burn The Fat is one of those books. Tom Venuto, who's name you may recognize from his weekly articles I post on this blog, is the author and someone who I consider to be my own personal fitness "guru". 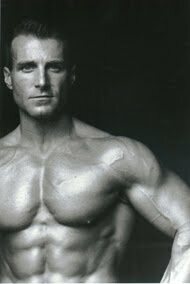 He is a lifetime natural bodybuilder and fat loss expert who has achieved an astonishing 3.7% body fat level without drugs or supplements. His book is a number one best seller and has seen hundreds of thousands of people in multiple countries achieve the body they want without "dieting". Today I consider myself a healthy individual. I have a metabolic rate of someone half my age, 10% body fat and eat only whole, clean foods. Hell, I even write my own Health Blog. But that wasn't always the case. I use to eat fast food, didn't know how to correctly workout at the gym, and was generally unhealthy. The turning point was when I saw myself in a photograph. I was this pudgy guy with no muscle tone and didn't like what I saw so I decided to do something about it. I tried every sort of fat burning, muscle building supplement you could buy spending ridiculous amounts of money on them with no results, bought those electronic abs gadgets where you attach the electronic pads to your stomach in hope of revealing a six pack, and went on crazy low carb crash diets which only saw me bingeing even more on sugary, carb loaded foods by the end of the week. I enjoyed going to the gym, but didn't know what were the most effective exercises or when and how to do cardio, so never really saw any muscle gain. Exhausted and fed up I did some research on the net and came across Tom's book Burn the Fat, Feed the Muscle and bought it. I remember not being able to put it down and I read chapter one that night, which is the goals and motivation chapter. I realized that my mind was working against me – my own negative thoughts were preventing me from achieving my goals. Actually, I didn’t even have goals until I was done reading the first chapter. I went to bed that night with a completely different perspective, and I already had a plan for the next day. I finished the rest of the book that week, and my life hasn’t been the same since. To say that my body has changed would be an understatement. 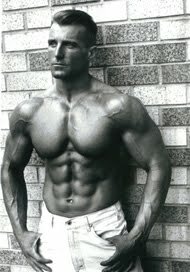 I learned more about nutrition and realized why I was doing everything wrong and why I wasn't losing any fat or building any muscle. This program really isn’t a diet, it’s a new way of living, and I was eating way more than I had on any diet I had been on before. It taught me what to eat and when to eat it to lose fat and build muscle, and what exercises I needed to be doing at the gym. There are a lot of garbage diet programs out there. I should know because I’ve tried them all. Burn the Fat, Feed the Muscle really worked for me, and I would recommend it for anyone who has been struggling to lose weight for a long time without any success. I know most of my readers out there are really only trying to lose a few pounds, put on a little muscle and overall just eat healthier, but some people who have read this book have lost more than 100 pounds and one guy lost 218 pounds. I am going to continue to recommend this book to you, because I personally believe in it. I'm really dedicated to losing weight. And I want to learn more about nutrition and exercise. This book sounded like a good resource to educate myself so I went to the website to check it out. I'm not gonna lie. This guy seems really sketch. I mean what do you think his website says about him? LOL yeah Tom is totally legit. I can understand what you mean though, there are so many fake sites out there these days. A lot of my readers have purchased his book and love it. He is also a paperback author and you can buy his books on amazon and in barnes and noble etc so this should help you realize his authenticity. But s with everything, if you don't feel comfortable buying something on the web. then you shouldn't.